On the month of March, Oppo had announced to launch its new model Oppo A5s next week. It is of dimension 155.9 x 75.4 x 8.2 mm and weight of 170 g. The device will come up with Dual SIM slots supporting Nano 4G sim cards. It will come with a waterdrop-shaped display notch with 720 x 1520 pixels resolution and ratio 19:9 provided protection of Corning Gorilla Glass 3. The size of the screen will be 6.2 inches. The device will be running on version of OS Android 8.1 (Oreo) with Color OS 5.2. Oppo A5s will come up with a chipset of Mediatek MT6765 Helio P35 (12nm) with Octa-core CPU and GPU PowerVR GE8320. The phone is also available in two different variants: one having internal memory of 32GB with 2/3 GB RAM. Another will have internal memory of 64GB and 4 GB RAM. The internal memory can be further expanded up to 256 GB via microSD for which slot is provided in the device. The main dual camera is of 13 MP and 2MP respectively with additional features of LED flash, HDR and panorama. The front selfie camera is of 8 MP with HDR feature. 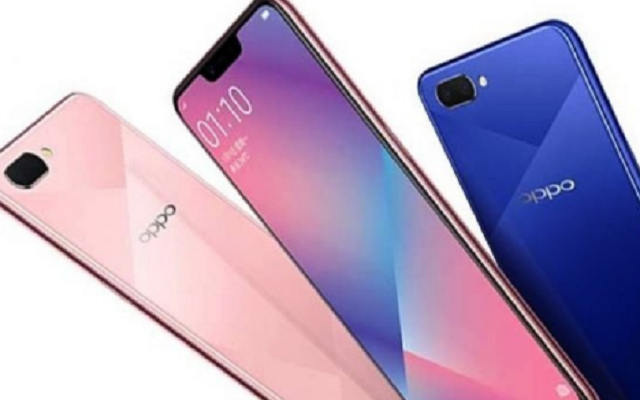 The other connectivity of Oppo A5s includes Wi-Fi 802.11 b/g/n, WiFi Direct, hotspot, Bluetooth 4.2 with A2DP, LE, GPS with A-GPS, GLONASS, GALILEO, BDS, FM radio, microUSB 2.0 and USB On-The-Go. The sensors of the device includes rear mounted Fingerprint sensor, accelerometer, proximity and compass. The phone will come up with a Non-removable Li-Ion 4,230 mAh battery. The company have set the final price of the phone to Rs 11,949. The phone will be available in four different colour variants Red, Black, Gold and Green.